There are people who are disgusted by the thought of bitter foods while others love them. Doctors have found the answer to this mystery. Typically, those who like to eat bitter food have a low body mass index (BMI), and those with high BMI do not like the bitter taste. Each of us wants to feel and look good and also to enjoy food. Balanced and varied diet is the key not only to a good figure but also to a good health. That is why the choice of food we make every day is important because on it depends how we will feel and what our health will be. In the ancient Indian medicine Ayurveda , which is more than 5000 years old, a great deal of attention is given to food and the way to eat. This ancient medicine believes that food can be both medicine and poison. That is why, according to Ayurveda, great attention during meals is paid on spices, herbs, minerals, noble crystals, metals and also colors. According to Ayurveda, the food should be delicious in order for it to be completely beneficial. Also, the ancient medicine considers that different tastes have a different influence on the different organs of our body. Ayurveda believes that food is a medicine and plays an important role in maintaining the balances in the body. With the emergence of Ayurveda, emerged also the taste therapy. In Ayurveda, the water, which is the first element, plays a major role in the good perception of taste. The humidity of the tongue is important for the proper taste perception of each substance when eating. There are six main tastes in Ayurveda: sweet, sour, salty, spicy, bitter and tart. These six flavors of Ayurvedic food are actually derived from the five original elements and, according to Ayurveda, we should always try to make them all available on our table. In addition, each of the tastes should be dosed in the dishes to fit our personal constitution in order to achieve a healthy balance of natural energies in our body and to feel well after eating. 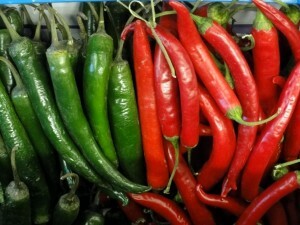 Salty taste, for example, is associated with the elements Fire and Earth, Sweet is associated with the elements Earth and Water, sour – with Earth and Fire, spicy – with Fire and Air, bitter – Ether and Space and tart – with Earth and Air. The three Doshas Vata, Pitta, and Kapha are made up of two elements and each of the tastes corresponds to two Ayurvedic elements. Apart from the doshas, the different tastes can be classified according to virya, rasa and vipak. Rasa represents the initial feeling in the mouth that the food creates. Virya is the cooling or warming effect it causes when it’s already in the stomach. Vipak is the aftertaste that the food leaves. Salty and sweet foods, for example, have a sweet vipak. Every person is recommended a taste according to their Ayurveda constitution. Apart from the personal constitution, food should also be selected according to the health of the person and the season. Ayurveda cooking includes the use of many spices, herbs and plants that add to the dishes a rich palette of pleasant aromas and flavors. That’s why Ayurvedic recipes provide us with delight of the senses and a really great gastronomic experience. For people with Vata constitution, excessive consumption of spicy, bitter or tart foods is not recommended. These foods increase the element Air and can cause the formation of gases. Pickled, salty and sweet foods are suitable for this type of constitution. Sour, salt and sweet foods are not recommended for people with Kapha constitution. They increase the prime element Water. For Kapha, it is appropriate to eat foods with bitter, tart and spicy taste. Sweet taste is the most dominating taste among all. Water and earth are the elements of sweet taste. Each food produce is sweet to a certain extent. It contains sugars, carbohydrates, amino acids, fats. Primarily grains, milk and fruits have a sweet taste. These are: sugar, sweet root, dates, pumpkin, rice, wheat, elm, mint, red carnation, maple syrup. Water, which is considered the primary element of life, is also sweet. Sweet is heavy in nature and is characterized by slow digestion. Its properties are to soothe hunger, soothe the nervous system, quench the thirst, fill the body with energy, regulate the water balance. 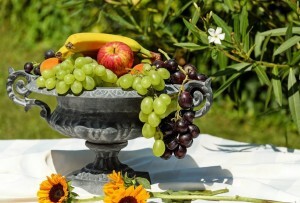 It is even considered that if consumed moderately, sweet food contributes to longevity. The sweet taste creates a sense of burning, has a cooling effect and acts anabolically. This taste is appropriate for every type of body, but the Vata and Pitta constitutions are able to consume it in a larger quantity than Kapha. The sweet taste reduces Vata and Pitta and increases Kapha. Sweet taste is produced from the Earth and Water. Salty foods are best suited for Vata. Other body types can consume it in small quantities. 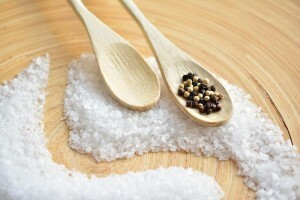 Salty taste is formed from Earth and Fire and is hot and heavy in nature. It has a cleansing, detoxifying and lubricating action on the tissues of the whole organism, activates all body processes, works well on mucous membranes, stimulates the function of the digestive system, promotes electrolyte balance and facilitates the absorption of minerals. Good sources of salt are sea, Himalayan and rock salt, various algae species such as kelp, tamari soy sauce and black olives. Salt can also be found in most watery vegetables such as tomato, cucumber, zucchini, as they contain large amounts of natural salt solution. Excessive consumption of salt affects the blood and skin badly. The effect of salty foods is anabolic, increases Pitta and Kapha and reduces Vata. Salty foods have a hot effect. Salty foods improve digestion, act soothing and have a laxative effect, increase the saliva secretion. They also have the ability to neutralize other flavors and create fluid retention in the body. The sour taste has a warming effect and is mostly recommended for Vata, with Pitta and Kapha consuming it in very small quantities. It reduces Vata and increases Kapha and Pitta. Sour foods stimulate digestion, promote the disposal of waste from the body, stimulate the appetite. The Water and Fire elements create the sour taste. All organic acids are sour. Fruits such as lemon, strawberries, grapefruit, kiwi, green grapes, tamarind (Indian date) are sour and only a bit sweet, as well as hibiscus and hip tea. 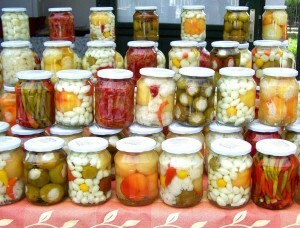 All fermented foods such as different kinds of pickles, cheese, yogurt, soy sauce, vinegar and wine are sour. The bitter taste exists thanks to Air and Space. It is considered to be the lightest and most chilling of all tastes. 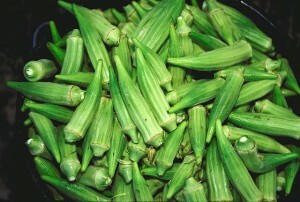 Due to its cooling quality, the bitter taste has a strong detoxifying effect and removes waste products from the body. 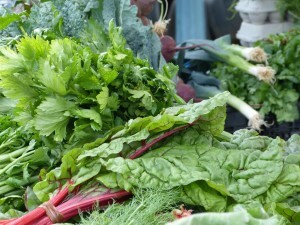 It also stimulates clear thought and can be found in almost all bitter foods like leafy greens such as lettuce, sorrel, endive, rhubarb , dandelion roots, milk thistle, bitter are the fresh roots of turmeric, aloe vera, various spices and herbs such as fenugreek, gentian roots, green and black tea and most herbal teas. Bitter taste is found in alkaloids and glycosides. It is mostly recommended for Pitta, and other body types can also consume it. It increases Pitta and Vata and reduces Kapha. Kapha can consume it in small doses, and the least amount is recommended for Vata. Spicy taste, of course, has the hottest impact of all Ayurveda Rasas. This taste is the most favorable to Kapha constitution. Vata should consume it in small quantities, and Pitta will do well to consume it rarely. For the Vata constitution it is good to consume spicy foods in combination with salty, sour and sweet foods. The spicy taste makes metabolism faster, increases the appetite, intensifies the senses, improves brain function, maintains the balance of secretions in the body and improves blood circulation. 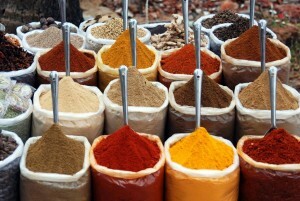 Spicy food has a cleansing effect on the sinuses; it is formed by the fire and the air element. Spices such as pepper, chili peppers, onions, turnips, ginger, mustard, garlic, hot spices from which asafoetida and all substances and oils that are volatile give the spicy taste. Tart foods, same as the bitter ones in Ayurveda, are also considered medicine. A very small amount of food with tart taste is recommended for all body constitutions. The tart taste is composed of Air and Earth and is considered to be the purest among the other six tastes. It has a cooling, dry effect. Tart foods are mainly the legumes such as green beans and white beans, fruits such as green bananas, pomegranates, cranberries, green grapes, okra, alfalfa sprouts, hydrastis, myrrh, turmeric, alum. Other foods with tart taste are the teas made from the bark of trees. The latter, for example, are a rich source of tannins. Most of the vegetables have a tart taste. Tart foods cause gas release and are therefore not recommended for the Vata constitution, but Kapha and Pitta have the right to consume them more often. Stipulated foods have a firming effect and help the body get rid of the accumulated toxins. Another of their properties is that they reduce secretion, strengthen the body and have a clear the thoughts. Regardless of what taste each person prefers, the facts say one thing – bitter foods have a beneficial effect on the whole organism. Bitter foods not only stimulate metabolism and fat burning but also increase our natural energy, improve digestion and concentration, purify our body from toxins and increase immunity.